Dry roast the channa dal, coriander seeds, pepper, cardamom, cloves, cinnamon stiks and red chilli and fry the same till the color the mixture changes to light brown. Remove from heat and keep aside. Add the coconut to the same pan and continue frying till you get a nice aroma from the coconut and the color changes to light brown. 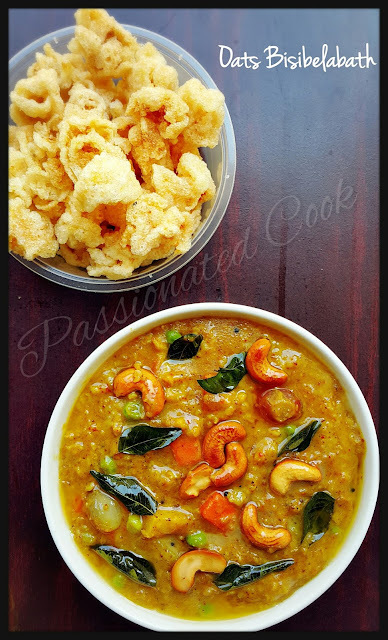 Cook the dal in pressure cooker with turmeric powder, mash them and set aside. Clean and chop the veggies to small pieces. Add water and little salt and boil till tender. Peel the onions shallots and chop the tomatoes, keep it ready. Soak the tamarind in the water and take the extract. Dry roast the Oats for 2 minutes in a low to medium flame, till you get nice aroma. Keep aside. Add one teaspoon of Ghee/ oil and fry the cashew till it turns out to a light brown color and keep it aside. 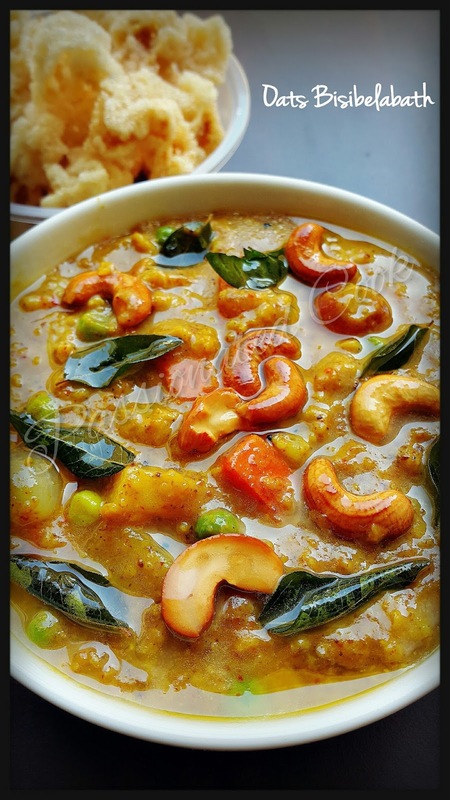 In the same pan add some oil / Ghee, add mustard seeds and curry leaves, fry till they splutter. Add the onion and fry for about a minute, then add the chopped tomato and turmeric, keep frying till the tomatoes are soft. Add the tamarind extract to the onions n tomatoes and allow the mixture to boil for 5 minutes till the raw smell of tamarind goes. Then add the salt, cooked vegetables, mashed dal and 2 cups water, stir well. Keep the flame low and allow the mixture to boil for 2 mins. Add the prepared bisibelabath powder and mix well. Let the mixture boil in low flame for about 5 mins. Add in the oats and mix well, keep the flame low and close the pan with a lid and allow it to cook for 2 minutes. 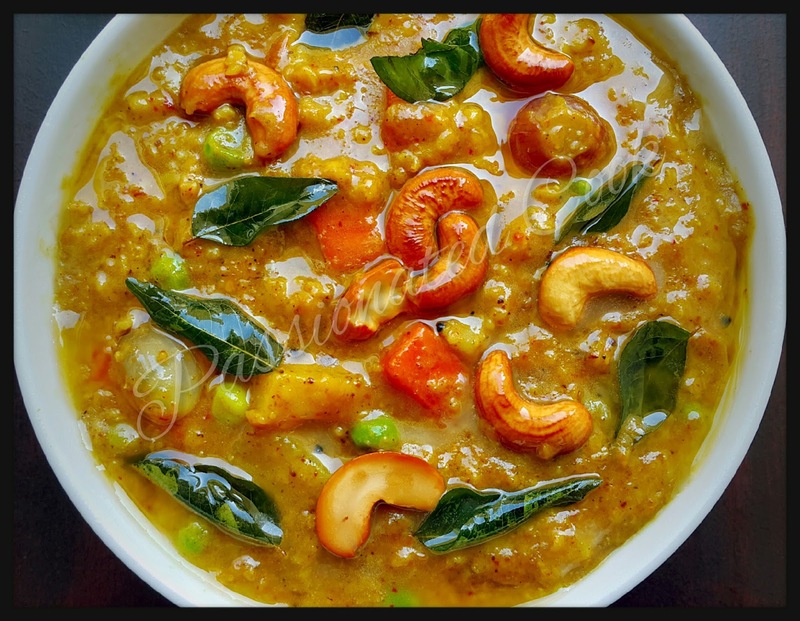 At this stage add 1 table spoon of ghee and the fried cashew, mix well.